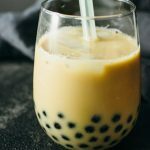 Here’s my recipe for classic bubble tea (boba): brewed coffee with milk and tapioca pearls, served chilled over ice. Cook the tapioca pearls according to package instructions. After cooking, drain and add the tapioca to cold water for half a minute. Then drain and add the tapioca to a bowl with honey, lightly stirring. Prepare a 16 ounce or larger glass. Add ice cubes. Pour in coffee followed by milk. Scoop tapioca pearls into the drink, including any remaining honey. Insert a thick straw and give a quick stir. Drink immediately.